This has been a fun and great way to find more books for my TBR pile! Thanks for all you've done. 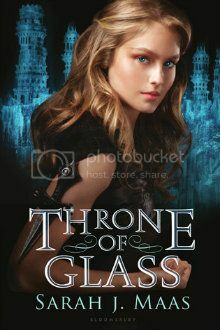 Throne of Glass was such an exciting book. I am eager to read the next one. I recently found out that Sarah wrote novellas that take place before ToG, and I am super excited. Thanks for the giveaway! This was a great story -- loved the idea behind it! Thanks for the giveaway! This is one of my favorite reads from this year. I would love to win a copy, so thanks for the giveaway! oH I cannot wait to read it :) heard a lot of wonderful about it! This book looks so good. I have wanted to read it for months now. This book sounds fantastic! Thanks so much for sharing! This book was one of my favorites this year as well! Thanks for the giveaway, I really want to own a copy so I can reread it as many times as I want! Thank you so much for the chance! I've been really looking forward to this one! I've been searching for a good fantasy book to read. Strangely, even though this book has been on TBR forever, I didn't realize that it belonged to the genre. The protagonist sounds pretty kickass, and who doesn't lvoe a good sword fight? Thanks for the giveaway!